As urbanization and populations increase, condos are becoming a much more popular housing option, particularly among younger generations as well as retirees looking to downsize. The benefits of condo living include: maintenance is taken care of, an array of great amenities, underground parking, city living, and more energy efficiency among others. Let’s get started and dig a little deeper! Short for condominium, a condo is a privately owned residence in a larger building or community. Contrary to popular opinion, a condominium is a form of ownership rather than a type of building. While most condos around the world are apartments, townhouses, duplexes and even detached houses can also fall under the same ownership structure. All condos are defined by the existence of common shared areas, with all condo owners required to maintain these areas through the provision of regular monthly fees. The condo lifestyle has become an increasingly attractive option to people across the world, especially in Canada and parts of the United States. Most condo buildings consist of multiple apartments in urban areas, with people often moving into a condo to improve their quality of life. Along with the benefits of living in a central location, condo owners also enjoy access to building amenities and reduced maintenance costs. The convenience of condo living does come at a cost, however, with all condo owners needing to pay monthly fees to a condo board. There are numerous types of condos available to purchase, including new or pre-construction condos, renovation condos, and re-sale condos. New condos are just that, brand new buildings that have been developed especially to house people. Renovation condos are also popular in some locations, with developers splitting up industrial and retail buildings in order to renovate them and transform them into apartments. Re-sale or used condos are another huge segment of the market that describes existing condos that are bought and sold on the private market. Along with the different types of properties on the market, condos can also differ with regard to their location, size, and price. While central locations are always a hit with young people, suburban and rural condos are becoming more popular all the time. Generally speaking, people will pay more for a central location that is close to attractions and amenities. Access to building amenities will generally increase the condo purchase price and monthly fees, as will the size and age of the apartment. Interestingly, the size of the building is often inversely proportional to the cost, with smaller buildings often associated with exclusivity and increased fees due to less people sharing maintenance costs. Before buying a condo, it's important to understand condo characteristics and how condo ownership differs from a conventional real estate purchase. A condo is considered a hybrid form of ownership, with numerous legal and technical characteristics needing to be defined in contracts to determine ownership. Unlike a conventional ownership agreement, there is a key difference between the individually owned unit and the common areas of the building. When you buy a condo, you own the apartment unit itself. This includes the internal rooms, interior walls, balconies, patios and storage areas. While the size and shape of the unit can vary considerably, all condo ownership agreements are defined by interior rooms and the divisions that exist between interior and exterior spaces. Unlike traditional real estate purchases, you don't own any land when you purchase a condo, which is defined as a common area for legal purposes. The common areas of a condo building are what differentiates it from a conventional real estate purchase. Other than the individual unit itself, all other parts of the property are considered common elements or areas. Depending on the building in question, this may include the roof, ceilings, exterior walls, basement, foundations, lobbies and hallways among other elements. Services and installations are also included as common property, including electricity, water and gas connections. It's important to understand the difference between common elements and limited common elements, with limited elements being those that are directly connected to individual condominiums, such as outer doors, windows and balconies. The way that exterior and interior space is defined can differ considerably between building and locations. Common areas also include building facilities such as pools, gyms, playgrounds, tennis courts, etc. The number and quality of facilities is one of the biggest factors that will influence your monthly maintenance fees, so it's important to compare condos based on your access to amenities. While not directly related to common building areas, the employment of staff to maintain these areas can also increase your monthly fees. 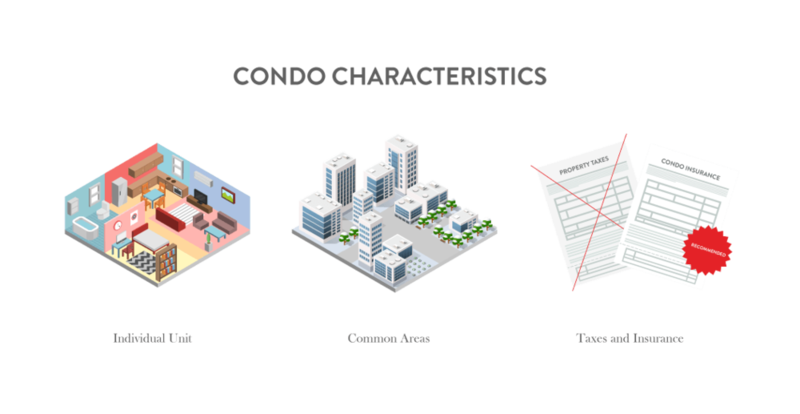 For tax purposes, each individual condo unit is individually assessed and taxed, including its share of common elements. It's important to note that monthly condo fees do not include property taxes. Like any other form of property ownership, it's important to be responsible and fulfill your property tax obligations in your jurisdiction. In most OECD countries, property tax is a source of federal revenue defined by the value of the property and the property tax rate in question. When it comes to insurance, coverage is mostly confined to the inside of your condominium. Much like taxes and maintenance obligations, the external areas of your building will fall under the jurisdiction of your condo association. While a master insurance policy will be in place for the entire building, details of this coverage can vary considerably between buildings and locations. A dedicated condo insurance policy is typically recommended to provide coverage for things like interior walls, appliances, and personal belongings. The existence of common property in addition to private property is the single element that defines a condominium. Monthly fees are required to maintain this common property, with these fees representing the single biggest additional expense of a condo compared to a traditional residence. In the United States, the organization that sets these fees is known as the Homeowner Association (HOA). In Canada, this organization is called the Condo Board. Whatever you call it, the condo board is responsible for the management, upkeep, and maintenance of all common areas. This board forms an integral part of the condo ownership structure, with each association established from the outset when a condominium development is created. As a condo owner, you are required to pay monthly maintenance fees and follow the rules and guidelines set down by this board. While most fees are paid on a monthly, quarterly or annual basis, the association may charge a one-time “special assessment” fee to cover large jobs such as replacing a roof or installing a new plumbing system. Condos come in all shapes and sizes, with different types of buildings having a huge effect on the initial purchase cost and the ongoing fee structure. Condo buildings are generally defined by their age, with pre-construction condos available alongside new condos, renovation condos, and re-sale or used condos. When purchasing a condo, it's important to get something that suits your needs and meets the demands of your budget. When looking at condo developments, there will be specific things you will be looking for. Location, square footage, amenities, etc. But it’s not just if your condo has a 900+ sq ft, a bedroom or three, a lovely view, it’s also about the amenities and how close you are to city life, especially if you’re a young professional living in the city. When buying a condo, many people choose to purchase a pre-constructed or newly constructed unit. Unless you've built a house yourself, most people haven't had the chance to live in a newly constructed home. In fact, the never-been-touched nature of these units is one of the chief attractions of condominiums for one segment of the market. While new condos can be more expensive than used condos, they will often be less expensive in terms of outgoing maintenance and utility costs. While pre-construction condos and new condos are very similar, pre-construction units are purchased before they've even been built. This is necessary for many exclusive and popular designs, where individual units are snapped up months or even years before they've been built. When buying a pre-constructed unit, you may also be given an opportunity to customize the floor plan and personalize the space through bespoke technology and design elements. When purchasing a pre-built unit, it's important to be very careful and do your homework regarding the company involved. Buying a new condo is similar to buying a pre-constructed design, although this time, the building already exists. The obvious advantage of going down this route is that you can physically walk around the building, get a feel for the space, and inspect the quality of work. While pre-constructed units always come with detailed 3D floor plans and some even include virtual reality viewings, nothing beats time on the ground. Advantages of a new condo include access to modern amenities and energy efficient appliances, customized floor plans, personalized materials and interior features, and lower maintenance costs. Depending on the building and company in questions, possible disadvantages of a new condo include higher costs, additional waiting times, lack of mature landscaping, and impersonal floor plans. While the six month median time to complete a new construction can be an advantage for some people, unforeseen delays and heavy customization can cause headaches for others. Purchasing an existing condo can be a great alternative, with renovation, re-sale or used condos offering a number of distinct advantages. Renovation condos are an interesting middle ground, with existing industrial and commercial buildings re-purposed for residential dwellings. While the external building is generally renovated to retain its historic character, the interior space is normally modern and fresh. A number of exclusive luxury condos are actually renovation projects, most of which are smaller buildings with fewer apartments. The vast majority of re-sale condos are not high-end renovation projects but existing condos sold on the conventional real estate market. While you obviously miss out on the never-been-lived-in charm of a new unit, used condos come with their own distinct advantages. While there are notable exceptions, new constructions typically take place in suburbia where land is still available. Existing buildings are more likely to reside in sought-after inner city areas, more likely to include mature landscaping, and less likely to conform to standard modern floor plans. Perhaps the biggest advantage of an existing condo, however, is the ability to move in straight away. When buying a pre-constructed condo, new buyers may have to wait months or even years before getting the front door keys. This is simply not an option for some people. Used condos are also cheaper than new condos in many cases, especially if they're located in an older building or lack modern amenities. While pre-constructed condos can be more affordable than used units in some cases, this situation varies considerably depending on the building and location. Possible disadvantages of an existing condo include higher maintenance costs, lack of modern appliances and design features, and no ability to customize the floor plan or design. Higher maintenance costs are an important consideration for older buildings, including more expensive monthly fees and a higher possibility of incurring a one-time “special assessment” fee to cover large jobs. When it comes to real estate, location will always be one of the most critical considerations. Whether you're buying a detached house in the suburbs or a condo in the CBD, it's important to choose a location based on research rather than guesswork. Think about the location you want, inter-city condos, high rise condos, or the oceanfront condos? While people in the market for a condo often spend a long time researching things like building amenities and monthly fees, deciding where you want to live is even more important. When looking at the real estate listings, be sure to focus on neighborhoods that are important to you. What neighborhood do you want to live in? Do you have a short list if your first choice is unavailable? What are the crime statistics like? What is the average income? What’s the rent in the area? Where are the closest transportation hubs? When choosing a neighborhood for your new condo, there are so many things to take into consideration. Visiting the neighborhood during the day and night is a great place to start. Are you comfortable? Can you picture yourself walking down the streets? Along with spending time on the ground, you can also access facts and statistics from websites, forums, and government portals. You can also talk to real estate experts. Safety is an important consideration for most people, with crime statistics readily available for locations in Canada and the United States. It's also important to look into geography. While hills can add character, you may not want to walk up a steep hill to get home every day. Are there parks close by? Are there dog parks close by, in case you have or consider having a furry friend. Have you thought about air quality and noise pollution? Closely related to neighborhood are considerations surrounding proximity and commuting. While people have vastly different needs when it comes to where they want to live, everyone wants to live close to certain amenities or attractions. If you're working, it's important to analyze your commute time and how this will affect your lifestyle. If you have kids, you need to check out the quality of the local schools and how far they are away. If you like eating out or going to the theater, you need to do some research. One of the best ways to compare locations is based on the Walk Score, a website and app that rates potential home locations based on their proximity to attractions and amenities such as grocery stores and restaurants. Google Nearby and Around Me are similar services that allow you to examine various locations in terms of your current lifestyle needs. Regardless of where you want to live, it's important to compare and contrast various neighborhoods and homes based on the things that are important to you. Along with the type of condo, the price, and the location, it's crucial to look into the building amenities. The availability of amenities has a huge impact on your monthly fees and your lifestyle, with common examples including pools, gyms, fitness centers, tennis courts, common areas, holistic wellness features, technology and connectivity, and parking. Access to specific amenities can transform your life, which is why so many people are prepared to pay more for condos with extras. To make sure you are within your price range, you have to do extensive research. Condo developers are paying close attention to how they structure amenities to meet the needs of condo buyers. While each additional amenity raises condo board fees, there is a sweet spot where developers can satisfy the needs of potential residents without pricing themselves out of the market. Traditional amenities such as pools and gyms are not enough in isolation, with developers increasingly paying attention to technology and wellness trends. Technology and building connectivity have become an integral part of many modern lifestyles. From advanced fiber optic Internet through to robotic cleaning and electric vehicle charging stations, forward-thinking developers are paying close attention to how they integrate technology throughout a building. Smart devices and appliances are a big part of this movement, with condo owners able to control lighting, security systems, and domestic appliances even when they're away from the building. Health and fitness amenities have always played an important role in condo buildings, with developments often featuring swimming pools, gyms, and tennis courts. Along with these traditional amenities, there is a growing market for yoga studios, meditation rooms, and community spaces designed to accommodate visiting massage therapists. Communal spaces are also becoming more important, from large entertainment areas through to niche meeting rooms, children's playrooms, and wine tasting rooms. Whatever you need from your condo, it's important to compare buildings based on their amenities along with their location and price. The existence of common elements defines a condo building, with the existence of monthly maintenance fees to support these elements an important responsibility that needs to be addressed. When looking into condos and homes, it's important to compare monthly fees amounts and structures. HOA fees can vary considerably based on building quality, amenities, building size and building age. More amenities typically means higher fees, with older and smaller buildings also more expensive due to higher maintenance costs and less people to share respectively. The existence of staff can also increase fees dramatically, so if the building has a pool cleaner or gardener, it's important to take this into account. Before signing a condo contract, it's important to look into what services the fees are designed to cover and how often the fees are increased. For example, while all building fees cover amenities, some may also cover things like services and parking. Along with the cost of regular maintenance fees, which are generally paid monthly and quarterly, it's also important to look into the contingency fund and what it can be used for. While regular fees take care of building upkeep and most maintenance tasks, large-scale jobs such as replacing the roof may require additional funds. If the HOA's reserves aren't enough to pay for large expenses, the association may charge an extra assessment that can run into thousands of dollars. Due to economies of scale, special assessments are normally smaller for large communities and higher for smaller communities. Along with the fees, it's crucial to look into the rules and regulations set up by the condo board. Generally speaking, the HOA or condo board will apply certain rules that all residents need to adhere to, including covenants and conditions and restrictions (CC&R). These rules can vary considerably from building to building, which is why it's so important to do your homework. For example, you may not be able to paint your front door a certain color, park a certain type of vehicle in the driveway, or hang your washing on the balcony. Condo boards often post their rules and regulations online, with your real estate agent able to track down specific documents if asked. Along with the rules that can affect your lifestyle, you need to pay particular attention to the rules regarding non-payment of fees and CC&R violations. You may also wish to assess the environmental practices of the HOA, meet some of your potential neighbors, and get a copy of the minutes from the last meeting to get a good grasp of what you can expect when you move into the building. Before you can purchase a new or used condo, you need to get approved for a mortgage. There are lots of things to consider before you can get approval, with most lenders looking at the relationship that exists between your deposit amount, income, debt levels, and credit score. There are additional hurdles to overcome if you want to purchase a condo, with the condo association also needing to qualify in order for your mortgage to be approved. In Canada, the situation is very similar, with lenders looking into each condo board with a fine-toothed comb. While you still need to pass a mortgage stress test yourself, it's also important that your building is up to scratch. Because the financial stability of a condo project depends on the financial health of an entire building, lenders may view condo loans as a more complex and potentially riskier investment than a single house. Condos are often more affordable that standard houses, especially in densely populated urban areas. However, it's important to account for monthly maintenance fees along with the initial sale price. Like any real estate purchase, condo prices vary considerably according to location, size, building age, and amenities. Living in a condo means abiding by the rules and regulations set out by the HOA or condo board. There is likely to be a master insurance policy, monthly maintenance fees, and lifestyle rules such as noise restrictions and limits on how you can renovate your apartment. It's important to check your obligations before signing a contract. People often move to a condo to improve their lifestyle. While this means different things to different people, you may be able to live in a more central location and have greater access to recreational amenities. The lack of external building maintenance can also help to free up your weekends. Condo living is all about community. While you don't have to live in your neighbor’s pocket, condo association meetings and common building areas generally lead to a greater degree of interaction with those around you. Before buying a condo, it often makes sense to meet your neighbors and attend a HOA meeting to see if you're a good fit. There are many different types of condos that you can purchase, from pre-constructed units through to newly built condos and used condos. While you can purchase units directly from the developer in many cases, consulting with an expert realtor is the best way to compare condos and meet the obligations of your purchase agreement.